Drill pipe wiper are ready stock : 2.3/8", 2.7/8", 3.1/2", 4", 4.1/2", 5", 5.1/2", 6" All are ready 17" & 19" OD. ANY SIZE. DUAL SPLIT TYPE. 17" or 19" od. 2.3/8" to 6.3/8" id. 2.7/8",3.1/2", to any size x 19" & 17" outer dia. contact : 98305 37535. mail : das9368@gmail.com. 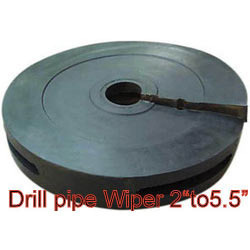 Drill Pipe Wiper is made available by us in several specifications for our valuable customers. 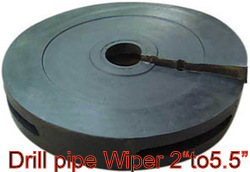 Drill Pipe Wiper is made available by us in several specifications for our valuable customers. Widely utilised in oil based as well as water, Gas Cuttings, Tearing and Abrasion, based drilling applications, it is highly demanded for industrial usage. Inner Diameter: 2" to 5.1/2"
Looking for Drill Pipe Wiper ?